Primary affiliation: Dipartimento di Psicologia, Università di Bologna, Italy. Other affiliation: Centro studi e ricerche in Neuroscienze Cognitive, Cesena, Italy (see my CsrNC personal page). Postal address: Dipartimento di Psicologia, viale Berti-Pichat, 5, 40127, Bologna, Italy. The research is mainly focused on integration of multi-sensory inputs (vision, touch, proprioception, hearing, vestibular) in order to represent the body and the space. At the moment, the research has an important application in studying whether and how multisensory integration can be applied to rehabilitation of unisensory deficits, such as hemianopia. In particular, the relationship between recovery of hemianopia and oculo-motor system and the phenomenon of blind-sight in hemianoptic patients have been studied. Another research topic is investigating mechanisms underlying neglect rehabilitation by prism adaptation. In addition, by combining techniques including behavioral assessments, psychophysiological responses, and the investigation of patients with brain lesions recently we investigate the complex interactions between learning, emotion and the human brain. Key words: multisensory; space; blind-sight; eye movements; neuropsychology; cognitive rehabilitation. - 2012-2014. President of Master Degree in “Neuroscience and Neuropsychological Rehabilitation”, University of Bologna, Italy. - 2005-2009. 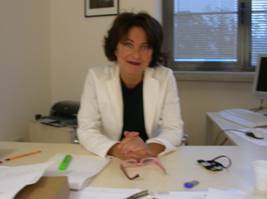 President of Italian Society of Neuropsychology (http://www.sinp-org.it/). - 2000-2009. President of Master Degree in “Neuropsychology and Functional Rehabilitation in life-span”, University of Bologna, Italy. - 2000-to present. Scientific Director, Centro studi e ricerche in Neuroscienze Cognitive, Cesena, Italy (http://www.cnc.psice.unibo.it/). - 1998-to present. Full Professor, Faculty of Psychology, Università di Bologna, Italy. “Blindsight” refers to the ability of some cortically blind patients to discriminate visual events presented within their scotoma, despite being unaware of the visual stimulation. Possible neural mechanisms responsible for visual residual functions are still under debate. Two main neural pathways have been identified in the visual system: the retino-geniculate-striate pathway, responsible for conscious identification of stimuli and the retino-tectal-extrastriate pathway, involved in automatic stimuli localization. The retino-tectal-extrastriate pathway includes also subcortical structures involved in eye movements generation, such as the superior colliculus. The aim of the project is to investigate a possible role for these structures in mediating blindsight. The project will combine neuropsychological and psychophysics methods with eye movements recordings, EEG recordings and transcranial magnetic stimulation. Patients with visual field defects often exhibit impairments in visual exploration and a typical defective visual scanning behaviour. It has been showed that a training based on a systematic audio-visual stimulation can improve patients’ visual search abilities. The purpose of the project is to study the mechanism underlying the amelioration of visuo-spatial disorders following the treatment by combining neuropsychological assessments, eye movements recordings, EEG recordings and lesions study. The aim of this research is to understand how the brain learns and stores information about danger. Using Pavlovian threat (fear) conditioning and other experimental paradigms, we investigate the mechanisms through which conscious emotional feelings, as opposed to behavioral or autonomic responses, come about. Some of the techniques we use to explore threat memory in the brain include brain lesions (patients with amygdale lesion), EEG and eye movements recording in healthy human volunteers (subjects with high and low alexitimia) and in patients with fear/anxiety disorders. 1. Maier ME, Scarpazza C, Starita F, Filogamo R, Làdavas E (2016). Error monitoring is related to processing internal affective states. Cogn Affect Behav Neurosci 16, 1050-1062. 2. Bertini C, Grasso PA, Làdavas E (2016). The role of the retino-colliculo-extrastriate pathway in visual awareness and visual field recovery. Neuropsychologia 90, 72-79. 3. di Pellegrino G, Làdavas E. Peripersonal space in the brain (2015). Neuropsychologia 66, 126-133. 4. Làdavas E, Giulietti S, Avenanti A, Bertini C, Lorenzini E, Quinquinio C, Serino A (2015). a-tDCS on the ipsilesional parietal cortex boosts the effects of prism adaptation treatment in neglect. Restor Neurol Neurosci 33, 647-662. 5. Cecere R, Bertini C, Maier ME, Làdavas E. Unseen fearful faces influence face encoding: evidence from ERPs in hemianopic patients (2014). J Cogn Neurosci 26, 2564-77. 6. Cecere R, Bertini C, Làdavas E. (2013). Differential contribution of cortical and subcortical visual pathways to the implicit processing of emotional faces: a tDCS study. J Neurosci 33, 6469-6475. 7. Bertini C, Cecere R, Làdavas E (2012). I am blind, but I "see" fear. Cortex 49, 985-993. 8. Serino A, Barbiani M, Rinaldesi ML, Làdavas E (2009). Effectiveness of prism adaptation in neglect rehabilitation: a controlled trial study. Stroke 40, 1392-1398. 9. Leo F, Bolognini N, Passamonti C, Stein BE, Làdavas E (2008). Cross-modal localization in hemianopia: new insights on multisensory integration. Brain 131, 855-865. 10. Bolognini N, Rasi F, Coccia M, Làdavas E (2005). Visual search improvement in hemianopic patients after audio-visual stimulation. Brain 128, 2830-2842.